. كما يقدم شقق ميلبورن شورت ستاي الكثير من الخدمات لإغناء رحلتك في ملبورن. يقدم الفندق واي فاي مجاني في جميع الغرف, خدمة سيارات الأجرة, مرافق مخصصة لذوي الاحتياجات الخاصة, واي فاي في المناطق العامة, صف السيارات لضمان الراحة القصوى لضيوفه. لقد جهزت هذه الإقامة الفندقية بعناية فائقة لتوفر مستوى عالي من الراحة. في بعض الغرف يجد النزيل تلفزيون بشاشة مسطحة, غرفة معيشة منفصلة, غرف لغير المدخنين, مكيف هواء, تدفئة. يمكنك طلب اللائحة الكاملة للخدمات في الفندق ومن بينها مركز للياقة البدنية, حمام سباحة داخلي, حديقة. إن شقق ميلبورن شورت ستاي هو خيار ذكي بالنسبة للمسافرين إلى ملبورن، بما يوفره من إقامة هادئة ومرحة. مكتب الإستقبال مفتوح من 07:00 صباحاً إلى 08:00 مساءً الضيوف الذين سيصلون خارج هذا الوقت يطلب منهم التواصل مع العقار مباشرة قبل موعد الوصول لترتيب هذا الأمر. أجر إضافي يتراوح بين1.5% و 2.5% سينطبق عند استخدام بطاقة إئتمانية. لمزيد من التفاصيل برجاء التواصل مع العقار. العقار يطلب مبلغ تأمين مسترجع بقيمة 500AUD عند تسجيل الدخول. على النزلاء التوجّه إلى العنوان التالي لتسجيل الوصول: 187 سيتي رود، ساوث بانك. يجب على النزلاء الذين يحجزون شقة من غرفة نوم واحدة أو غرفتي نوم مبلغ تأميني ببطاقة الائتمان بقيمة 100 دولار أمريكي وبطاقة هوية تحوي صورة شخصية عند تسجيل الوصول. يجب على النزلاء الذين يحجزون شقة من 3 غرف نوم مبلغ تأميني ببطاقة الائتمان بقيمة 500 دولار أمريكي وهوية تحمل صورة شخصية عند تسجيل الوصول. This was a great option close to Southbank. It's a little away from the main attractions but very cheap, clean and quite new. Highly recommended if you are prepared to walk for 10 minuted to Southbank. A few issues with this place, location and facilities are ok, check is done in another location! so once you have checked in and got your keys you then have to leave this building and proceed down the street dragging your luggage with you! in our case it was pouring down with rain and we were both soaked, check out procedure is the same. On the second day we asked for the room to be serviced and were told no problem thats $50 per service, overall would not stay there again. 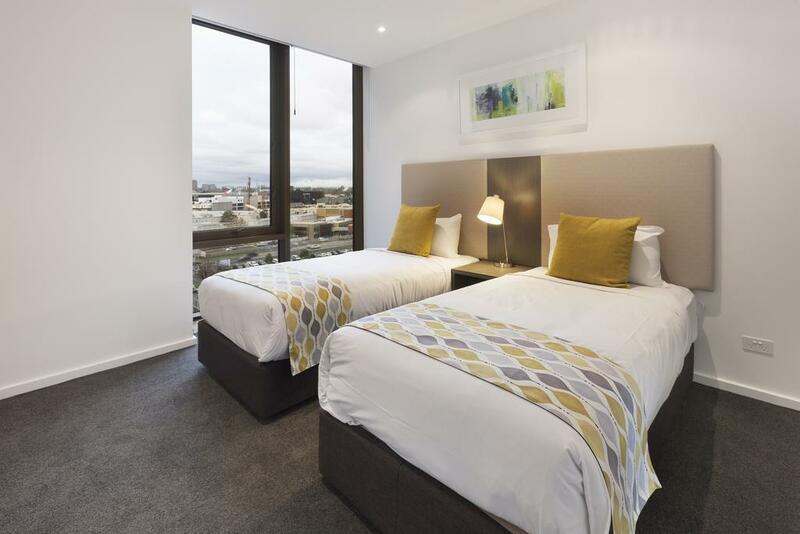 Nice little apartment with good facilities including a pool, and a convenient location close to the National Gallery of Victoria, Theatres, Restaurants, Botanical Gardens, Federation Square, Casino, Yarra riverfront, walk to the city and close to Flinders Street train station and Swanston Street trams. blinds don't quite block out the city lights so if you're light sensitive might be good to pack a sleep "mask" for the eyes. I have been with Agoda for many years now and I rarely give 5 stars for every category but this place has everything we need. I have seen many reviews mentioning the need of an air conditioner in the bedroom but since we are here during winter, that was not a problem for us but I hope the management should look at this issue for the summer months. Thanks for a great stay! Beautiful new apartments, but no daily service, only after 7 days, and no air con in the bedrooms, recommend you check these first. 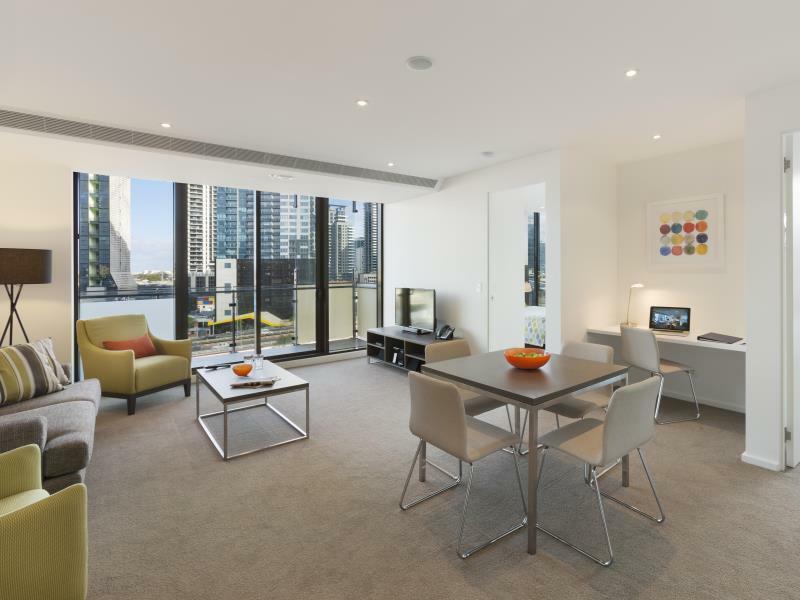 Nice fully fitted apartment, close to southbank. Cleanliness is super. Off-street parking is helpful, alternatively you can get full day parking at $23. The apartments provide you with all basic necessity. The view from our apartment was amazing. Perfect for families with your children. Just a few minutes to station. They have us a room on the high floor with a balcony and an awesome view of the city. Enjoy the stay. But the walk to the station is very windy, better visit during the summer. 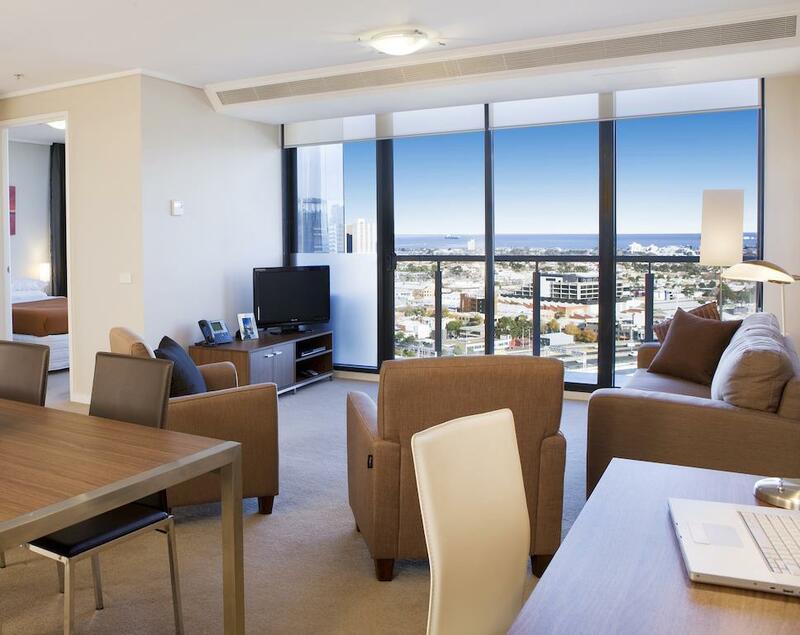 The apartment is new and modern with spacious balcony. The unit is good for 3 to 4 people. 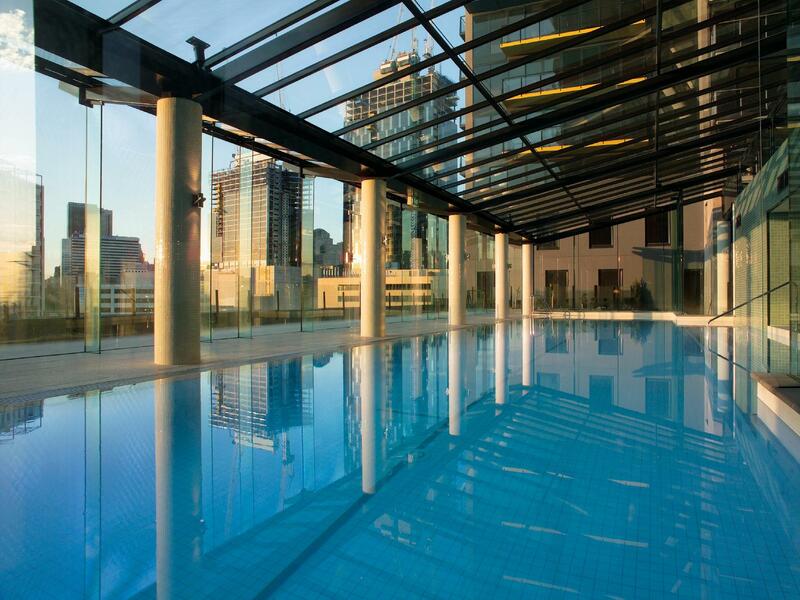 The location is conveniently located near Melbourne Crown Casino and not too far from the heart of the city. Staff are very friendly and helpful. Overall very happy very happy with the stay and I would recommend to others especially those who love to try their luck in one of the best casinos in Australia. Great Apartment to stay and good location. The location of the appartment was excellent and access was easy. The room was clean, but being on the western side of the beholding, in the afternoon sun, it was unbearably hot. Air conditioner faced away from bedrooms, so they took a long time to cool down. Was told at reception that a deposit was going to be taken from the card, although this was not noted anywhere prior to arriving. When I questioned why they needed to take the money and didn’t just need the card, I was met with indifference and “it’s just policy”. I was then informed that money would be deducted from the card for any damage done. I asked for someone to come an inspect the room on leaving and was told “we don’t do that. It will get checked by housekeeping.” Upon arriving at the room, several of the blinds were severely damaged to the point that they were barley hanging on or did not work. When I questioned reception, they said “yes, we already knew about that in that apartment.” A bit disappointing. 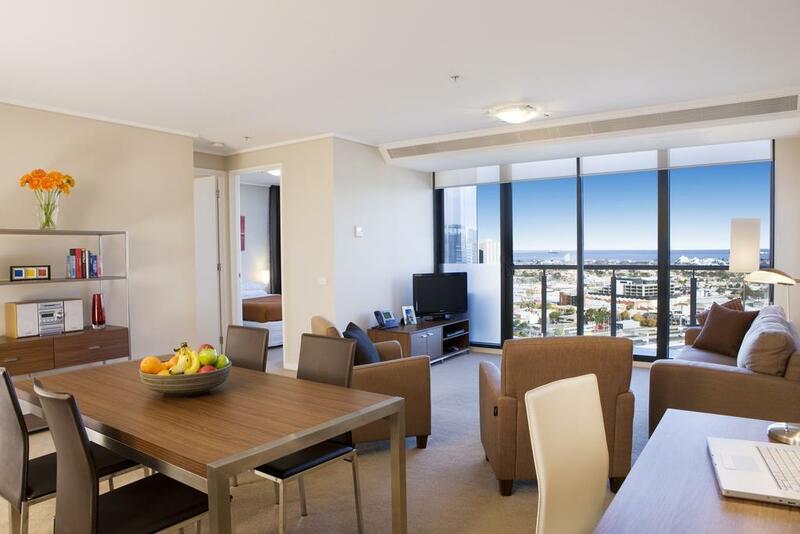 everything within walking distance, 5nin walk to casino and Rod Laver a short drive. Lovely area to walk around South wharf and the river. Only thing was the train tracks are pretty close to the property. I was on level 19 & didn't notice too much noise tho. 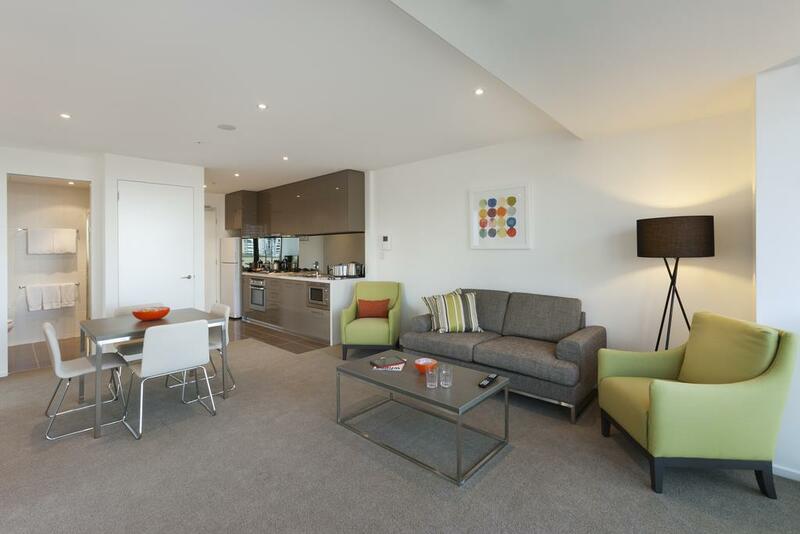 This apartment is centrally located, close to Southbank and within walking distance of many attractions. The kitchen was well equipped with all you need to make your own meals for a day out in the city. Easy to find and friendly staff. I'd rather to pay more than to experience this. AC is not working properly. Staff don't really care about general situation and every time is so difficult to reach. Poor facilities and we stayed for 5 days; they don't clean any single day ( like really, ewww) and we even need to buy our own toilet papers, napkins etc. We stayed at a brand new apartment for the new year period, it was well equipped and had fantastic 270 degree view of the river, city and port, we watched the NYE fireworks fro the balcony. The location was close to the riverfront and the city, however there were not a lot of cafes (non-touristy ones) within walking distance. 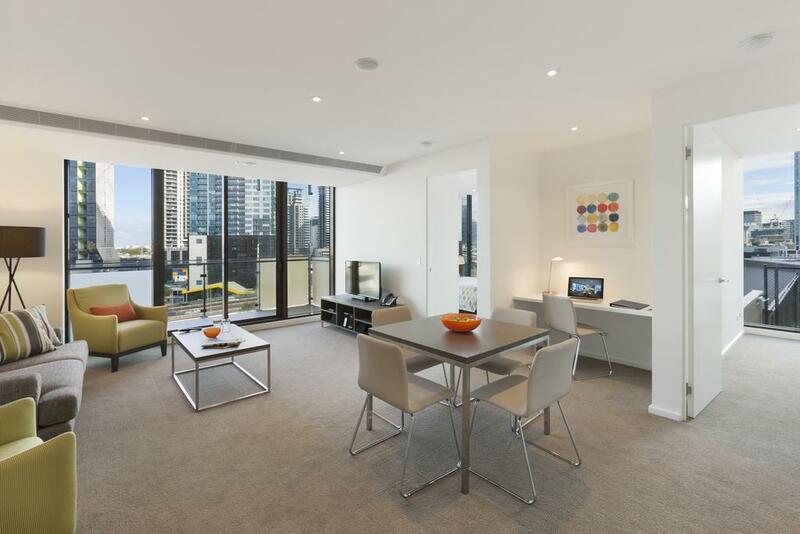 This was a very well equiped apartment close to Melbourne CBD, public transport and the docklands area. I would recommend this accomodation to other travellers. The only issue we had was the combination washer dryer was a bit temperamental. I would definitely use them again for my next trip to Melbourne.